We’ve just celebrated Easter, and it’s the perfect time for a lesson on data collection and representation! After all, how else could the Easter Bunny get all the information he needs to bring perfect Easter baskets to every household, if it weren’t for a bit of mathematical genius? Students will learn how to organize data with up to three categories and represent it on a simple grid. They’ll learn to interpret such graphs, and practice writing statements answering questions on data recorded. Bunny ears, if you want to be fun and go in character! 1st Grade Data Representation Worksheet, one per student. There’s an enormous amount of information in the world, and part of our job as intelligent people is to gather that information, organize it so that it is in a way we can use, and interpret it. It comes to us like a big unorganized pile, and our job is to take this messy information and make it nice and neat and easy to use. Today we get to learn how to do just that, and to make it extra fun, let’s start with as story. Can anyone tell me which holiday has just been (or is coming up)? Yes! And who comes to visit Easter morning, before you’ve even got up? You’re right, it’s the Easter Bunny! He comes to bring yummy treats or special little presents, but he doesn’t bring the same thing to each house; somehow he needs to know what is the perfect Easter surprise for every little girl and boy. How many little girls and boys does the Easter bunny visit? 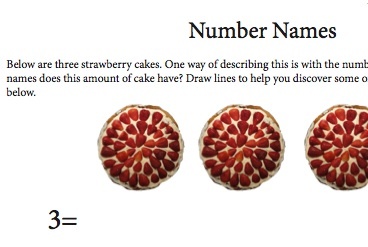 Give your students a chance to discuss the numbers, as specifically or vaguely as they like. The take away point: Lots and lots! Now put on your bunny ears: this is when the fun begins! You can get into character as much or as little as you like, depending on your personal teaching style; but the children will certainly appreciate you unbending a little and helping the pretend along with a few apt characterizations. Let’s pretend I’m the Easter bunny, and pretend I have a bag full of special treats. I’ve got white chocolate eggs and brown chocolate eggs, and I’ve got some plastic eggs filled with other fun surprises for children whose parents don’t want them to get too much candy. Suppose that I have a little notebook, and well before Easter, I start making plans so that on the big day I’ll know what I have to deliver where. I could go hide in everyone’s back yard and listen till I found out what kind of surprise they’d prefer, but since we’re all in class now, I’ll just ask. Starting with the front, ask the children which type of Easter surprise they would prefer: brown chocolate, white chocolate, or plastic eggs with little surprises. Write the information on the chalkboard in complete sentences, for instance “Leanna likes brown chocolate eggs best.” Go through six or seven children, and then stop and look at the board. Ask your students how much paper it would take for the Easter bunny to take notes on everyone he brought gifts to, and whether, when it was all written down, it would be easy for him to see how many brown chocolate eggs he needed and if he needed more plastic eggs than white chocolate eggs or more white chocolate than plastic eggs. Give the students a chance to discuss this; the conclusion, if you’ve done it right, should be quite simple:this is messy and difficult! Talk about what might make it easy. Some ideas they might come up with are neater handwriting, or using different columns (or notebook pages) for each of the three categories. Then tell your students you want to show them a super-easy way to write down information so it’s easy to look up after. Draw a large rectangle, and divide it into three rows and two columns; your first column will be used for labels and can be much narrower than the second. In the first column, write the labels. “Prefers brown chocolate”, “Prefers white chocolate”, “Prefers plastic eggs “ Go through the class again, asking the same questions and noting names in the appropriate columns. Tell them your columns are called a graph, and ask which way is easier to collect information: noting it in a graph, or writing about it? They should be pretty unanimous that the graph is easier. What about if you need to know which to pack more of, white chocolate, brown chocolate, or plastic eggs? Show your students how they can find this information in a glance from the graph. Drawing it from the written record is time consuming and difficult. Ask how many baskets with plastic eggs you would need if you were delivering Easter baskets to all the students in the class. Now give the students the handout, and ask them what three types of surprises they’d want to bring if they were an Easter bunny with the power to bring gifts to all their class-mates. Guide them in filling out the first column, and have them survey the other students in the class, writing down the names in the appropriate rows. Allow them to take turns showing their graph and sharing the information with the class. Ask which surprise most students preferred, which surprise fewer students were interested in, and how many students wanted a particular surprise. As an added exercise, you could have the students write three or four sentences describing their findings in their math journals. This will help cement the work they’ve done in class. Ordering: it’s one of the first math lessons in kindergarten, and it continues to be an important concept up through graduate school. Today, in your fourth grade math lesson, you’re going to be looking at ordering a set of numbers that may seem un-order-able to the uninitiated: dissimilar fractions. What is the secret to ordering fractions who use mismatching names and don’t want to stand in line? Find out their other, secret names! 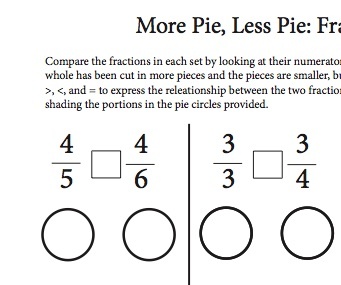 You’ll want to do this 4th grade fractions lesson after you’ve introduced equivalent fractions and given your students the tools to recognize and generate equivalent fractions. 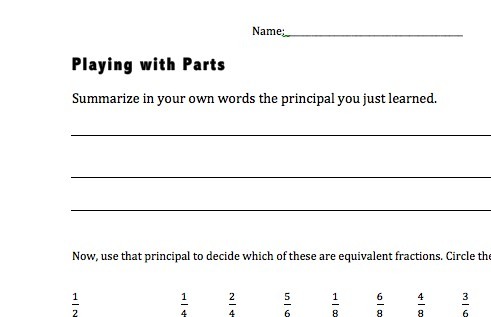 A free fourth grade lesson plan that covers those topics is available here. Your students will learn to compare two and more fractions with different numerators and different denominators. They’ll practice two different ways of doing this: 1) creating common denominators and numerators, and 2) comparing to a benchmark fraction such as ½. Start on a positive note: today, we get to play a fun new game! Remember, if you have fun with this, your students will too, and there’s no better way to wire the brain for optimal learning than by making learning fun. Hand out “My name is” fraction cards from your first stack to everyone in the class. Duplicates are not a problem. Have them insert the cards in the transparent pouches and hang them from their neck.. Explain that the fraction on this card is their name for the rest of the class; and that it will be especially important during a new game that is going to be played. Use your cellphone or MP3 player to turn on some music, and tell the students to mill around or ‘dance’ while the music is on. As soon as the music is off, they need to line up in order of their fractions. If they’re super-fast, there might be a prize. Play the music, turn it off, and give the students a small amount of time to make sense of their fractions and try to order themselves. Equivalent fractions stand share one place in the line (standing side by side) . You do not need to wait for them to be done before calling a halt. Observe that it was pretty difficult, and ask why. If no-one brings it up, you can observe that though we’ve learned to order fractions with similar denominators or numerators—fractions where the division size or number of portions was equal– we never learned anything about how to order fractions where both the top and the bottom were different. These fraction names could just as well be in different languages; they simply don’t want to be compared! If the fraction names are in different languages and so can’t be compared, what is one way we could compare them? Allow your students discussion time to consider this problem. If they do not arrive at the solution, give it to them: Even if fractions can’t be easily compared in their current state, you can translate them into similar languages so they are comparable! Remind them that one quantity can be described by more than one fraction; and that these different fractions that refer to the same portion are called equivalent fractions. Ask them how they might find other versions of their fraction names. Summarize their responses on the board, and review any bit that needs reviewing. Then invite them to the table at the front of the room, where you’ve created a big messy draw pile of all the remaining fractions. Give them some time to look through these cards and find their own equivalent fractions. Offer unobtrusive help to anyone who needs it. When they’ve all got their cards, tell them you’re to play the game again, and ask them whether it will be easier this time. Lead the discussion round to the fact that equivalent fractions, being representations of the same quantity, stand in the same place on the number line. Demonstrate how students can order themselves easily by comparing the fractions, finding pairs with the same numerator or the same denominator, and choosing an order based on that. Give everyone a chance to compare cards and order themselves, then applaud them on their work and return everyone to their seats. If they’ve made reasonable time, offer them a token prize. Write your findings on the board: we can compare dissimilar fractions by renaming them as equivalent fractions with common denominators or numerators. Now write 1/3 and ¾ on the board, and ask them if they can tell you quickly which is larger. Talk them through using ½ as a benchmark fraction—1/3 is smaller than ½ because 3 is larger than 2, and ¾ is larger than 2/4=1/2 because 3 is larger than 2. So since 1/3 is smaller than ½ and ¾ is larger, 1/3 is smaller than ¾. Ask which symbol you should put between the two fractions, and if necessary, offer a short review of >, =, and <. 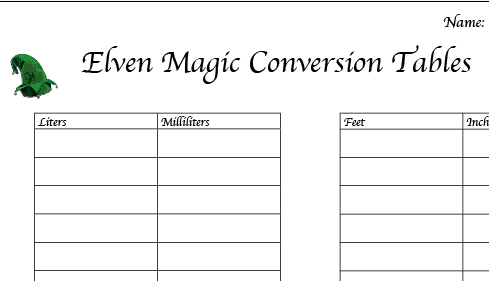 Now collect all the flashcards—the pile of originals and the pile of new names—distribute original fractions again, and give the students another chance to collect their new names from the draw pile. Ordering should be faster this time. Be available to help anyone who is struggling. Ask your students to take the Quick Quiz out and time themselves to see how fast they are able to order the fractions on that page. Play the music, turn it off, and give the students a small amount of time to make sense of their fractions and try to order themselves. You do not need to wait for them to be done before calling a halt. Observe that it was pretty difficult, and ask why. If no-one brings it up, you can observe that though we’ve learned to order fractions with similar denominators or numerators—tops or bottoms that are the same—we never learned anything about how to order fractions where both the top and the bottom were different. These fractions speak different languages, almost, and don’t want to be compared! Translate them into similar languages so they are comparable! Remind them that one quantity can be described by more than one fraction; and that these different fractions that refer to the same portion are called equivalent fractions. Ask them how they might find other versions of their fraction names. When they’ve all got their cards, tell them you’re to play the game again, and ask them whether it will be easier this time. Lead the discussion round to the fact that equivalent fractions, being the same number, stand in the same place on the number line. Demonstrate how students can order themselves easily by comparing the fractions, finding pairs with the same numerator or the same denominator, and choosing an order based on that. 3.MD.4 Generate measurement data by measuring lengths using rulers marked with halves and fourths of an inch. Show the data by making a line plot, where the horizontal scale is marked off in appropriate units— whole numbers, halves, or quarters. Measuring Time! Time to get up, stretch, and have fun with some hands on stuff! Here we look at a combination of measuring—an exciting hands on subject for most gradeschoolers- with a real-life application of fractions. The concepts presented here are simple and your students shouldn’t have much trouble with them, but, done right, they will provide an invaluable intuitive understanding of fractional parts. In fact, this lesson might be considered a foundation stone for future work in three important fields: measurement, fractions, and data representation on line plots. Students will learn to use the half and a quarter inch markings on their rulers: to take measurements down to half or quarter inches, to record their data appropriately, and to represent that data on line plots. This will also provide students with a visual representation of what fractions mean in real life. Start out by asking your students what they know about fractions. Using their suggestions, make a bullet-list definition/description on the board. If they’re out of ideas, help them. Take time to elucidate any concepts they are hazy on; this is your chance to get everyone started on the same page. Once you’ve gone through what they’ve learned about fractions, tell them that this lesson we aren’t going to learn anything new about fractions. Instead, we get to use what we’ve already learned in a measuring lesson. Ask them to start by getting out their rulers and measuring their middle finger. Student: My middle finger is 2 inches! Teacher: Is it exactly 2 inches, or a little more or a little less? Student: It’s a little less. Teacher: Do you see some other marks on your ruler? Those are fractions. Today I want us to learn how to measure more exactly, using those fraction markings. On the board, draw an oversized ruler going from one to three inches. Mark halves and fourths of an inch. Draw an object alongside the ruler; you might make it 1 ½ inches long. Teacher: Yes, the shaded area is half of the area between one and two, so this mark here is the half mark. So if my little fork reaches this mark, we say it is one and a half inches long. Erase your shading, and shade the area between 1 and 1 ¼. Teacher: Now how much of the area between one and two is shaded? You’re right! So if I have a little tiny pencil that reaches just to here (draw your pencil on the board) it’ll be exactly 1 ¼ inch long. Follow the same procedure to elucidate 1 ¾. Then draw a number of objects along your chalkboard ruler and get the students to label the lengths. When they have a good grasp of these chalkboard measurements, go back to the thumb problem and list the middle finger measurements they give you. How many middle fingers are two and a quarter inches long? Are most of the middle fingers in our class the same length? How many middle fingers are longer than [choose a median value]? Erase the board, draw a second line plot, and have the children measure their pencils, then take turns coming up to he front, noting down their measurement, and filling out an x on the graph. Now, give your students the worksheet. Ask them to start by measuring all the items in their desk and writing them down on a list. Pencils, erasers, notebooks, textbooks and pencil cases are some of the items that might be measured and recorded. Then, they should fill in the numbers on the line plot and mark it appropriately. Math Warehouse is a treasure trove of resources for the math teacher. You’ll find a large bank of high quality free lesson plans, all aligned with the common core, and a variety of helpful tools to make teaching easier. For instance, to make number lines like those in the worksheet you can use our Number Line Maker : it creates custom number lines as images you can download. This is only the beginning: your students need to cement their understanding of ordering and comparing fractions by doing lots of games and exercises. Take advantage of everything Mathwarehouse has to offer–all free— by visiting http://www.mathwarehouse.com/fractions/ and also looking through our lists of free lesson plans.